A look at the construction sector, focussing on the potential hazards and risks contractors can bring to your business and provide you with guidance on how to mitigate these risks and avoid damage to your business and brand reputation. The construction industry contributes £97 billion to the UK economy and directly employs 2.2 million people, totalling 7% of the total GB Workforce. In recent years, the construction output in Great Britain has increased. This growth in construction investment has led to increased revenues for construction firms operating in the UK. Fill out the form to download the document and find out more. 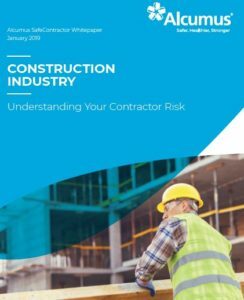 Understanding contractor risk in the construction industry This whitepaper from Alcumus SafeContractor looks at the construction sector, focussing on the potential hazards and risks contractors can bring to your business and provides guidance on how to mitigate these risks and avoid damage to your business and brand reputation.